An inspiring story of a Medicine Dispenser who became a Tibetan Medicine Doctor. Interview with Dr Tamdin Sangmo — a doctor with Men-Tsee-Khang, Tibetan Medical and Astrological Institute of HH the Dalai Lama. CSPA, Alappuzha, Kerala: Every second month, the calm, eco-friendly campus of Centre for Social and Political Arts (CSPA) at Sylviander Land, Alappuzha, becomes host to three-day Wellbeing Tibetan Medical Camp. Participants from all over Kerala come to consult the doctors regarding their health and lifestyle choices. In regular attendance to these camps is Dr Tamdin Sangmo. While she originally worked as a dispenser for Tibetan medicines, inspiration from both family and the wider Tibetan community inspired her transition into a full-fledged Tibetan Medicine Doctor. In order to learn about her history, perspectives, and values, we spoke for some time. Like many with parents who were exiled from Tibet, Dr Sangmo was born in India and grew up as a refugee in a South Indian Tibetan settlement area. "I feel gratitude to the people of India for providing us shelter as we try to return home", she tells me. While her brothers and sisters live abroad in Switzerland and America, she stays in India in order to propagate this medical tradition that has great relevance for the modern-day. For her, practicing Sowa Rigpa (Science of Healing) is an ethical act: she is doing her part to improve the health and sanitation of both Tibetan refugees and the wider public, regardless of caste, creed, or colour. "If it was not for my sister's inspiration, I would have never become a doctor", says Dr Sangmo. While working at the Tibetan herbal dispensary in 1989, her sister urged her to step into the doctor profession. At first she hesitated, but her sister insisted, stating that she had the caring capacity and focused outlook necessary for the job. Unlike other cultural contexts, Dr Sangmo emphasises that within the Tibetan community, there is no stigma surrounding women entering the medical field. In fact, she feels there to be an underlying philosophy of gender equality within the Tibetan community, especially regarding higher education. Working full-time and caring for her two sons was certainly not easy, but the support she received from her close kinship community made it all the easier. Her two sons are currently studying in a Tibetan medium school: "While I would love them to study Tibetan medicine, I do not push them to become anything. I want to give them the freedom and stability that is celebrated in Tibetan tradition." From 1992 to 1997, she earned her medical degree at the Men-Tsee-Khang, Tibetan Medical and Astrological Institute of HH the Dalai Lama. During her studies, she deeply examined the Tibetan approach to the mind-body relationship and health management, based upon ancient scriptures and the modern experiential and research-based wisdom of her professors. 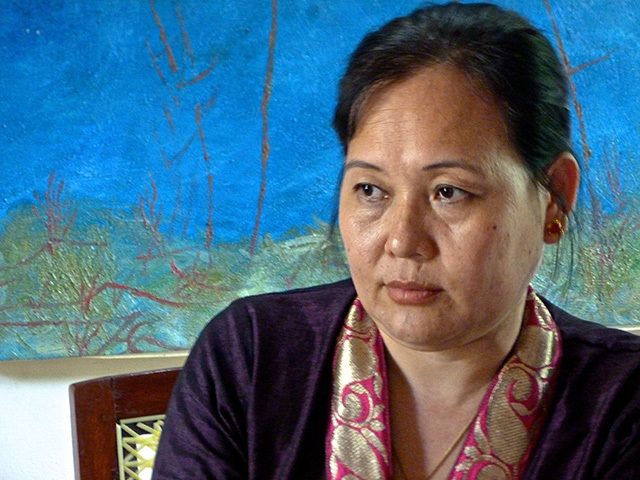 In 1998, she engaged in a year of internship at various Tibetan institutions, followed by working as a residential doctor in Mundgod, Karnataka, for six years, one of India's largest Tibetan settlements. With chronic conditions ranging from cardiovascular diseases, joint pain and skin disorders, to cancer and kidney disease, Dr Sangmo now consults up to thirty people per day at the Tibetan Medical Center in Bangalore. At the medical camps in Kerala, the numbers can range even higher. Regardless of the quantity of patients, the quality of the interaction is sustained: cultivating the Tibetan value of unbiased compassion for all living beings, she provides caring and undivided attention to everyone who comes. When I ask how Tibetan medicine is unique from other systems of medicine, Dr Sangmo emphasises two points: its non-violent approach, and use of sacred local herbs. Firstly, counter to the allopathic system, Tibetan medicine provides balance and harmony to the body. Without artificial medicines that result in dangerous side effects, Tibetan medicine gets to the root cause, while the lifestyle habits guided by the doctor allow the healing to have deep effects on the mind, body and soul. 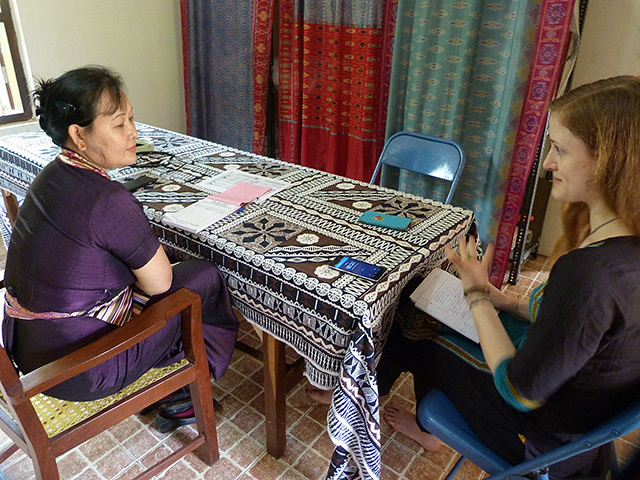 "The doctor-patient relationship in Tibetan medicine is based on compassion", she tells. Every morning before receiving patients, she and the other doctors and herbal dispensers will chant healing prayers. While she has grown up performing prayers in her home, these prayers have specific therapeutic intentions. Dr Sangmo adds: it is by articulating the words of the Medicine Buddha that she is able to guide the transformation of patients into liberated self-healers. Through these words, she can help others eradicate the three poisons that are the source of all sickness: attachment, hatred and ignorance. Secondly, Tibetan medicine's effectiveness is connected to its use of local herbs, grown naturally in Northern India. When the herbs are first picked, the cultivators chant prayers in healing, which then may be transferred to the patients: "These herbs are effective because they are made sacred through prayer, and given to patients based upon ancient scientific principles — it is both spiritual and scientific." While the Tibetan herbs are central to the curing process, also important is providing participants with lifestyle guidance and explanation of the body system in Tibetan terms. Victoria Sheldon (Right) with Sylvie Bantle, Dr Dorjee Rapten Neshar and Eswar Anandan during the 53rd Wellbeing Tibetan Medical Camp held at Centre for Social & Political Art, Sylviander House, Alappuzha from November 9-11, 2016. Dr Sangmo has never seen Tibet. "If given the opportunity, of course I would return", she confides. The fact that she uses the term 'return' for going to a place that she has never physically step foot in reveals a key element of modern Tibetan identity: the recognition that they have a genuine homeland. As our discussion winds up and we get ready for our organic lunch, she provides some final words: "through non-violence and compassion, Tibetan medicine is made useful to society. I hope that it is through these same qualities that society may help us to return to where we are from."